I'm sat writing this tucking into a bowl of porridge at 7pm and d'y know what? I do this a lot more than I'd like to admit. I could eat porridge at pretty much any time of the day. I'm like flipping Goldilocks. It's just so warming and filling and it's basically like my ideal comfort food. Like getting a hug in a bowl. You'll already know I'm a bit of fan of Flahavan's when it comes to my porridge. I've used them to make pretty summer porridge bowls and I even put their oats in my smoothies so when I heard about their latest launch, I got a bit excited! Because for the first time, they've launched sachets. Now it's not ground-breaking in the porridge world because let's face it Quaker have been doing this for a while BUT for fans of the brand it's pretty new and exciting. I really like Flahavan's. It's got a really natural, earthy taste to it and a fab texture. The oats are rolled so they have a bit of bite and just feel a lot more wholesome! Having the oats in the new sachet format now means I can keep a sachet in my bag and have it for breakfast when I get to work rather than having to worry about finding a stove! 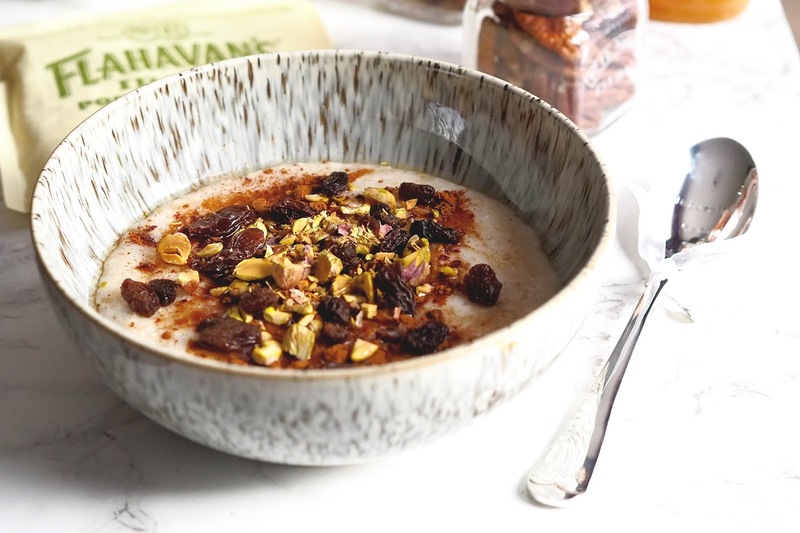 So to celebrate the launch, I wanted to share on my go-to porridge recipes which is perfect for warming you up on a cold morning! 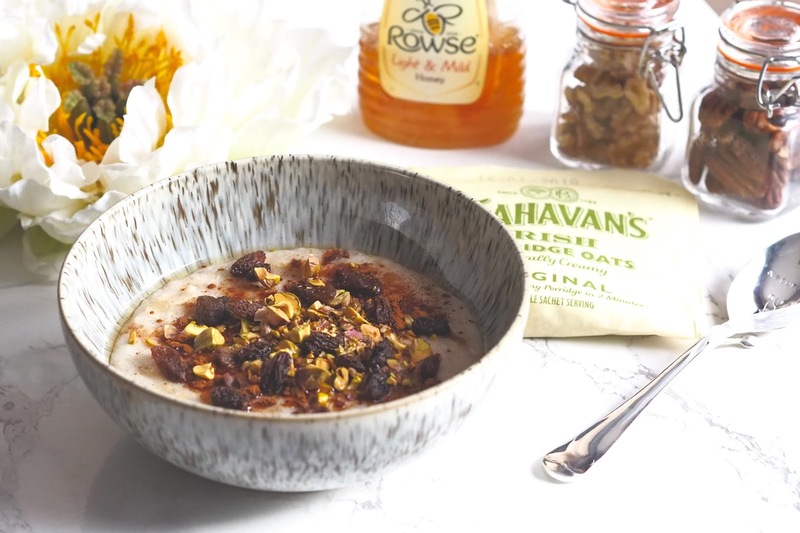 I used the new Flahavan's Irish Porridge Oats sachets for this recipe so it's SUPER simple. Ideal for doing the mornings when you get to work or when you're at home but short on time! 1. You just empty the sachet into a bowl then fill the empty sachet with milk (about 190ml) and pour over your oats. 3. Once it's cooled slightly and thickened up, top with your cinnamon, fruit and nuts (and chocolate if you're feeling adventurous) and enjoy! Super simple but SO tasty! To celebrate the launch of the new Flahavan's sachets, the team have given me a bundle of goodies to giveaway to you lovely lot! 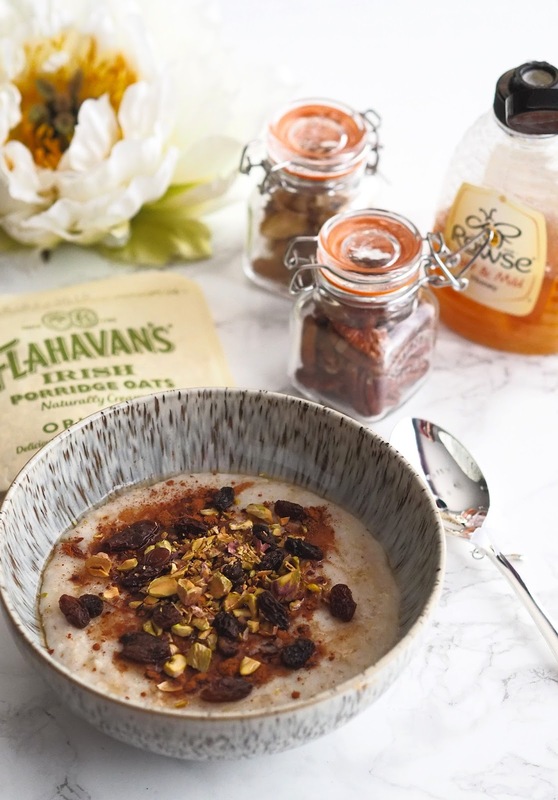 By entering (using the Rafflecopter widget below) you'll be in with the chance of winning a selection of the Flahavan’s range including Flahavan’s Irish Organic Porridge Oats, Flahavan’s Irish Jumbo Oats and Flahavan’s Irish Multi Seed Oats. Good luck! If you miss out, don't worry you can pick up the new sachets in a box of 10 at Waitrose for £2.40! Lovely giveaway. Just letting you know your home page is throwing up all kind of trojan warnings. Oh no, can you tell me which browser you're using as it doesn't come up on mine? I always eat porridge for my breakfast in the morning but am quite boring with it - must try adding fruit and nuts to it. I love Flahavan’s Oats. This article was great for getting inspiration on how to serve them. 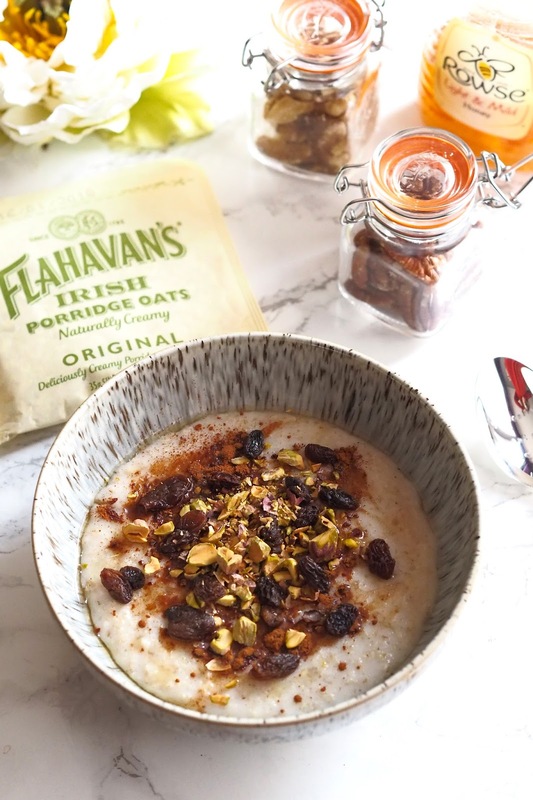 Flahavan's is my favourite porridge oats.It is so creamy with a fabulous taste and texture. So enjoy a bowl of porridge on a cold winter's morning. We love porridge for breakfast on a cold morning. I eat porridge for breakfast and lunch. Made with water, and extras in the form of hemp protein, seeds, raw nuts, fresh fruit, chia and nut butters, bee pollen and cacao chips. Not all at the same time though! Lovely giveaway, great for eating on those cold mornings. never tried this brand before, we usually go for another one. but they look great! Lovely prize. I love porridge. My hubby loves his porridge. He would love this. Porridge with honey and nuts is the best winter breakfast! i have porridge every other day! Big fan of porridge. I wonder if you can just put regular oats in a bowl with almond milk and mocrowave it? I'm all about less washing up too. The sachets are handy for eating at work. Most mornings are Porridge for me. Sometimes with sultanas & honey, but mostly just with Cinnamon💕 I've not tried Flahavan's Porridge, so would love the chance. This looks great for my husband! Unable to comment on the link page as it takes me to a scam page. Love porridge every morning for breakfast. I love Flahavan’s Oats it fills me until lunchtime. This article gave me more ideas on how to serve them. 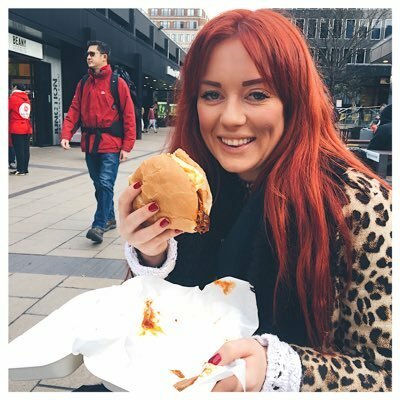 Very informative blog which was really interesting! Enjoyed reading! This is a lovely prize and I love porridge so this would be something special to win for me! I work evenings and like to take a pot of porridge with me for my tea . Love this porridge for breakfast 🍳 in a smoothie in a crumble raw in my homemade muesli u name it . Tasty giveaway & great blog! I go to the Boxpark in Shoreditch often & there are always great dishes to try out ...my tastebuds love me for it!